I want to use my own modem for my "gig" plan. I have a NETGEAR CM11000 which supports the speeds. Can I do this? or am i locked with spectrum modem/router they provided. The modem is supported as mentioned in the Minimally Qualified Modems list. Not at this time. Only Spectrum modems are officially supported on the Gig tier. You can use your own router if you want though. But now I have a problm ewith my router.... It says "Your ISP's DHCP does not function properly." It's an ASUS RT-AC88U. Fixed. Thanks to Asus support. So your customer owned Netgear modem is now activated on the gig tier? 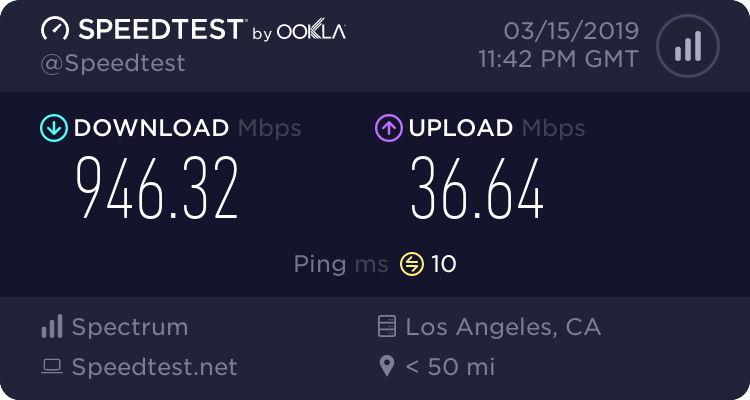 Are you seeing gig speeds or have they provisioned you for Ultra instead?